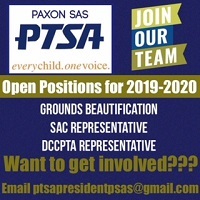 Paxon SAS families: We’d love to have you involved in our PTSA! 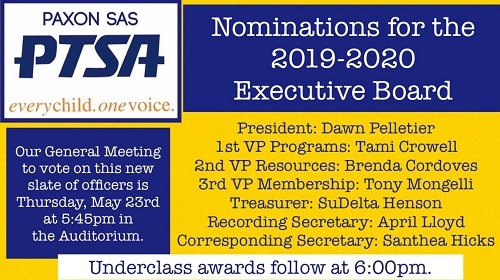 Here are some of the Chair positions open next year. Let us know if you’re interested! DCCPTA Rep attends the monthly DCCPTA meetings and sends monthly report to Paxon PTSA. Currently, they meet the 4th Tuesday of the month from 9:30-11:30am. Grounds Beautification coordinates dates to clean up flower beds and campus. Might also involve planting things. Some chairs have a budget. You also are invited to Paxon PTSA mtgs which are being moved next year to the third Friday of each month at 8:15am. 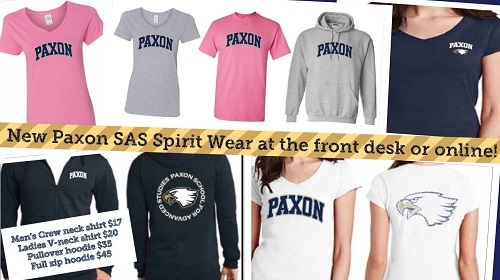 Click on the Paxon PTSA Online Store to purchase these new spirit wear items and many more using a credit card. You will receive an email when your merchandise is ready for pick up with your student ID in the front office. Paxon's Learning Lab is a student run tutoring service provided in room 216 before school, during each lunch period, and after school. More details on the subjects offered and the schedule for the Learning Lab can be viewed here. Online tutoring is also available at the Jacksonville Public Library at Brainfuse HelpNow.